"St George" redirects here. For other uses, see Saint George (disambiguation). Clothed as a crusader in plate armour or mail, often bearing a lance tipped by a cross, riding a white horse, often slaying a dragon. In the Greek East and Latin West he is shown with St George's Cross emblazoned on his armour, or shield or banner. Saint George (Greek: Γεώργιος, Geṓrgios; Latin: Georgius; d. 23 April 303) was a soldier of Cappadocian Greek origins, member of the Praetorian Guard for Roman emperor Diocletian who was sentenced to death for refusing to recant his Christian faith. He became one of the most venerated saints and megalo-martyrs in Christianity, and was especially venerated as a military saint since the Crusaders. England, Ethiopia, Georgia and several other nation states, cities, universities, professions and organisations all claim Saint George as their patron. 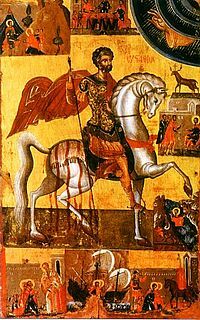 Very little is known about St George’s life, but it is thought he was a Roman officer of Greek descent from Cappadocia who was martyred in one of the pre-Constantinian persecutions. Beyond this, early sources give conflicting information. There are two main versions of the legend, a Greek and a Latin version, which can both be traced to the 5th or 6th century. The saint's veneration dates to the 5th century with some certainty, and possibly still to the 4th. The addition of the dragon legend dates to the 11th century. The earliest text preserving fragments of George's narrative is in a Greek hagiography identified by Hippolyte Delehaye of the scholarly Bollandists to be a palimpsest of the 5th century. An earlier work by Eusebius, Church history, written in the 4th century, contributed to the legend but did not name George or provide significant detail. The work of the Bollandists Daniel Papebroch, Jean Bolland, and Godfrey Henschen in the 17th century was one of the first pieces of scholarly research to establish the saint's historicity via their publications in Bibliotheca Hagiographica Graeca. Pope Gelasius I stated that George was among those saints "whose names are justly reverenced among men, but whose actions are known only to God." A critical edition of a Syriac Acta of Saint George,[clarification needed] accompanied by an annotated English translation, was published by E.W. Brooks (1863–1955) in 1925. The compiler of this Acta Sancti Georgii, according to Hippolyte Delehaye, "confused the martyr with his namesake, the celebrated George of Cappadocia, the Arian intruder into the see of Alexandria and enemy of St. Athanasius". In the Greek tradition, George was born to Greek Christian parents, in Cappadocia. His father died for the faith when George was fourteen, and his mother returned with George to her homeland of Syria Palaestina. A few years later, George's mother died. George travels to the capital Nicomedia and joins the Roman army. George is persecuted by one Dadianus. In later versions of the Greek legend, this name is rationalized to Diocletian, and George's martyrdom is placed in the Diocletian persecution of AD 303. The setting in Nicomedia is also secondary, and inconsistent with the earliest cultus of the saint being located in Diospolis. George was executed by decapitation before Nicomedia's city wall, on 23 April 303. A witness of his suffering convinced Empress Alexandra of Rome to become a Christian as well, so she joined George in martyrdom. His body was returned to Lydda for burial, where Christians soon came to honour him as a martyr. The Latin Acta Sancti Georgii (6th century) follows the general course of the Greek legend, but Diocletian here becomes Dacian, Emperor of the Persians. George lives and dies in Melitene in Cappadocia. His martyrdom is greatly extended, to more than twenty separate tortures over the course of seven years. Over the course of his martyrdom, 40,900 pagans are converted to Christianity, including the empress Alexandra. When George finally dies, the wicked Dacian is carried away in a whirlwind of fire. In later Latin versions, the persecutor is the Roman emperor Decius, or a Roman judge named Dacian serving under Diocletian. There is little information on the early life of Saint George. Herbert Thurston in The Catholic Encyclopedia states that based upon an ancient cultus, narratives of the early pilgrims, and the early dedications of churches to Saint George, going back to the fourth century, "there seems, therefore, no ground for doubting the historical existence of St. George", although no faith can be placed in either the details of his history or his alleged exploits. According to Donald Attwater, "No historical particulars of his life have survived, ... The widespread veneration for St George as a soldier saint from early times had its centre in Palestine at Diospolis, now Lydda. St George was apparently martyred there, at the end of the third or the beginning of the fourth century; that is all that can be reasonably surmised about him." Herbert Thurston, in the saint's entry in the early 20th-century Catholic Encyclopedia, takes the position that there are no grounds for doubting the historical existence of Saint George, "but no faith can be placed in the attempts that have been made to fill up any of the details of his history." Edward Gibbon argued that George, or at least the legend from which the above is distilled, is based on George of Cappadocia, a notorious Arian bishop who was Athanasius of Alexandria's most bitter rival, and that it was he who in time became Saint George of England. J. B. Bury, who edited the 1906 edition of The Decline and Fall, wrote "this theory of Gibbon's has nothing to be said for it." 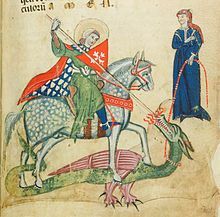 He adds that: "the connection of St. George with a dragon-slaying legend does not relegate him to the region of the myth". The legend of Saint George and the Dragon is first recorded in the 11th century, in a Georgian source. It reaches Europe in the 12th century. In the Golden Legend, by 13th-century Archbishop of Genoa Jacobus da Varagine, George's death is at the hands of Dacian, and about the year 287. The Golden Legend offered a historicised narration of George's encounter with a dragon. This account was very influential, and it remains the most familiar version in English owing to William Caxton's 15th-century translation. In the medieval romances, the lance with which Saint George slew the dragon was called Ascalon after the Levantine city of Ashkelon, today in Israel. The name Ascalon was used by Winston Churchill for his personal aircraft during World War II, according to records at Bletchley Park. In Sweden, the princess rescued by Saint George is held to represent the kingdom of Sweden, while the dragon represents an invading army. Several sculptures of Saint George battling the dragon can be found in Stockholm, the earliest inside Storkyrkan ("The Great Church") in the Old Town. Iconography of the horseman with spear overcoming evil was widespread throughout the Christian period. George (Arabic: جرجس‎, Jiriyas or Girgus) is included in some Muslim texts as a prophetic figure. The Islamic sources state that he lived among a group of believers who were in direct contact with the last apostles of Jesus. He is described as a rich merchant who opposed erection of Apollo's statue by Mosul's king Dadan. After confronting the king, George was tortured many times to no effect, was imprisoned and was aided by the angels. Eventually, he exposed that the idols were possessed by Satan, but was martyred when the city was destroyed by God in a rain of fire. Muslim scholars had tried to find a historical connection of the saint due to his popularity. According to Muslim legend, he was martyred under the rule of Diocletian and was killed three times but resurrected every time. The legend is more developed in the Persian version of al-Tabari wherein he resurrects the dead, makes trees sprout and pillars bear flowers. After one of his deaths, the world is covered by darkness which is lifted only when he is resurrected. He is able to convert the queen but she is put to death. He then prays to God to allow him to die, which prayer is granted. Al-Tha`labi states that he was from Palestine and lived in the times of some disciples of Jesus. He was killed many times by the king of Mosul, and resurrected each time. When the king tried to starve him, he touched a piece of dry wood brought by a woman and turned it green, with varieties of fruits and vegetables growing from it. After his fourth death, the city was burnt along with him. Ibn al-Athir's account of one of his deaths is parallel to the crucifixion of Jesus, stating, "When he died, God sent stormy winds and thunder and lightning and dark clouds, so that darkness fell between heaven and earth, and people were in great wonderment..." The account adds that the darkness was lifted after his resurrection. A titular church built in Lydda during the reign of Constantine the Great (reigned 306–37) was consecrated to "a man of the highest distinction", according to the church history of Eusebius; the name of the titulus "patron" was not disclosed, but later he was asserted[by whom?] to have been George. The veneration of George spread from Syria Palaestina through Lebanon to the rest of the Byzantine Empire – though the martyr is not mentioned in the Syriac Breviarium – and the region east of the Black Sea. By the 5th century, the veneration of Saint George had reached the Christian Western Roman Empire, as well: in 494, George was canonized as a saint by Pope Gelasius I, among those "whose names are justly reverenced among men, but whose acts are known only to [God]." The early cult of the saint was localized in Diospolis (Lydda), in Palestine. The first description of Lydda as a pilgrimage site where George's relics were venerated is De Situ Terrae Sanctae by the archdeacon Theodosius, written between 518 and 530. By the end of the 6th century, the center of his veneration appears to have shifted to Cappadocia. The Life of Saint Theodore of Sykeon, written in the 7th century, mentions the veneration of the relics of the saint in Cappadocia. 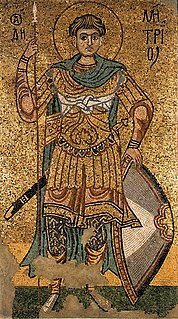 By the time of the early Muslim conquests of the mostly Christian and Zoroastrian Middle East, a basilica in Lydda dedicated to Saint George existed. The church was destroyed by Muslims in 1010, but was later rebuilt and dedicated to Saint George by the Crusaders. In 1191 and during the conflict known as the Third Crusade (1189–92), the church was again destroyed by the forces of Saladin, Sultan of the Ayyubid dynasty (reigned 1171–93). A new church was erected in 1872 and is still standing. In England, he was mentioned among the martyrs by the 8th-century monk Bede. The Georgslied is an adaptation of his legend in Old High German, composed in the late 9th century. The earliest dedication to the saint in England is a church at Fordington, Dorset that is mentioned in the will of Alfred the Great. Saint George did not rise to the position of "patron saint" of England, however, until the 14th century, and he was still obscured by Edward the Confessor, the traditional patron saint of England, until in 1552 during the reign of Edward VI all saints' banners other than George's were abolished in the English Reformation. Belief in an apparition of St. George heartened the Franks at the Battle of Antioch in 1098, which made a similar appearance the following year at Jerusalem. The chivalric military Order of Sant Jordi d'Alfama was established by king Peter the Catholic from the Crown of Aragon in 1201, Republic of Genoa, Kingdom of Hungary (1326), and by Frederick III, Holy Roman Emperor, and in England the 1222 Synod of Oxford declared Saint George's Day a feast day in the kingdom of England. Edward III of England put his Order of the Garter under the banner of St. George, probably in 1348. The chronicler Jean Froissart observed the English invoking Saint George as a battle cry on several occasions during the Hundred Years' War. In his rise as a national saint, George was aided by the very fact that the saint had no legendary connection with England, and no specifically localized shrine, as that of Thomas Becket at Canterbury: "Consequently, numerous shrines were established during the late fifteenth century," Muriel C. McClendon has written, "and his did not become closely identified with a particular occupation or with the cure of a specific malady." The establishment of George as a popular and protective saint in the West that had captured the medieval imagination was codified by the official elevation of his feast to a festum duplex at a church council in 1416, on the date that had become associated with his martyrdom, 23 April. Wide latitude existed from community to community in celebration of the day across late medieval and early modern England, and no uniform "national" celebration elsewhere, a token of the popular and vernacular nature of George's cultus and its local horizons, supported by a local guild or confraternity under George's protection, or the dedication of a local church. When the English Reformation severely curtailed the saints' days in the calendar, Saint George's Day was among the holidays that continued to be observed. George is renowned throughout the Middle East, as both saint and prophet. His veneration by Christians and Muslims lies in his composite personality combining several Biblical, Quranic and other ancient mythical heroes. William Dalrymple, reviewing the literature in 1999, tells us that J. E. Hanauer in his 1907 book Folklore of the Holy Land: Muslim, Christian and Jewish "mentioned a shrine in the village of Beit Jala, beside Bethlehem, which at the time was frequented by Christians who regarded it as the birthplace of St. George and by some Jews who regarded it as the burial place of the Prophet Elias. According to Hanauer, in his day the monastery was "a sort of madhouse. Deranged persons of all the three faiths are taken thither and chained in the court of the chapel, where they are kept for forty days on bread and water, the Eastern Orthodox priest at the head of the establishment now and then reading the Gospel over them, or administering a whipping as the case demands.' In the 1920s, according to Taufiq Canaan's Mohammedan Saints and Sanctuaries in Palestine, nothing seemed to have changed, and all three communities were still visiting the shrine and praying together." Dalrymple himself visited the place in 1995. "I asked around in the Christian Quarter in Jerusalem, and discovered that the place was very much alive. With all the greatest shrines in the Christian world to choose from, it seemed that when the local Arab Christians had a problem – an illness, or something more complicated – they preferred to seek the intercession of Saint George in his grubby little shrine at Beit Jala rather than praying at the Church of the Holy Sepulchre in Jerusalem or the Church of the Nativity in Bethlehem." He asked the priest at the shrine "Do you get many Muslims coming here?" The priest replied, "We get hundreds! Almost as many as the Christian pilgrims. Often, when I come in here, I find Muslims all over the floor, in the aisles, up and down." The Encyclopædia Britannica quotes G.A. Smith in his Historic Geography of the Holy Land p. 164 saying "The Mahommedans who usually identify St. George with the prophet Elijah, at Lydda confound his legend with one about Christ himself. Their name for Antichrist is Dajjal, and they have a tradition that Jesus will slay Antichrist by the gate of Lydda. The notion sprang from an ancient bas-relief of George and the Dragon on the Lydda church. But Dajjal may be derived, by a very common confusion between n and l, from Dagon, whose name two neighbouring villages bear to this day, while one of the gates of Lydda used to be called the Gate of Dagon." Saint George is described as a prophetic figure in Islamic sources. George is venerated by some Christians and Muslims because of his composite personality combining several Biblical, Quranic and other ancient mythical heroes. In some of he is identified with Elijah or Mar Elis, George or Mar Jirjus and in others as al-Khidr. The last epithet meaning the "green prophet", is common to both Christian and Muslim folk piety. Samuel Curtiss who visited an artificial cave dedicated to him where he is identified with Elijah, reports that childless Muslim women used to visit the shrine to pray for children. Per tradition, he was brought to his place of martyrdom in chains, thus priests of Church of St. George chain the sick especially the mentally ill to a chain for overnight or longer for healing. This is sought after by both Muslims and Christians. St George killed the dragon in this country; and the place is shown close to Beyroot. Many churches and convents are named after him. The church at Lydda is dedicated to St. George; so is a convent near Bethlehem, and another small one just opposite the Jaffa gate, and others beside. The Arabs believe that St. George can restore mad people to their senses, and to say a person has been sent to St. George's is equivalent to saying he has been sent to a madhouse. It is singular that the Moslem Arabs adopted this veneration for St George, and send their mad people to be cured by him, as well as the Christians, but they commonly call him El Khudder—The Green—according to their favourite manner of using epithets instead of names. Why he should be called green, however, I cannot tell—unless it is from the colour of his horse. Gray horses are called green in Arabic. The mosque of Nabi Jurjis which was restored by Timur in the 14th century, was located in Mosul and supposedly contained the tomb of George. It was however destroyed in July 2014 by the Islamic State of Iraq and the Levant, who also destroyed the Mosque of the Prophet Sheeth (Seth) and the Mosque of the Prophet Younis (Jonah). The militants claim such mosques have become places for apostasy instead of prayer. George or Hazrat Jurjays was the patron saint of Mosul. Along with Theodosius, he was revered by both Christian and Muslim communities of Jazira and Anatolia. The wall paintings of Kırk Dam Altı Kilise at Belisırma dedicated to him are dated between 1282-1304. These painting depicts him as a mounted knight appearing between donors including a Georgian lady called Thamar and her husband, the Emir and Consul Basil, while the Seljuk Sultan Mesud II and Byzantine Emperor Androncius II are also named in the inscriptions. 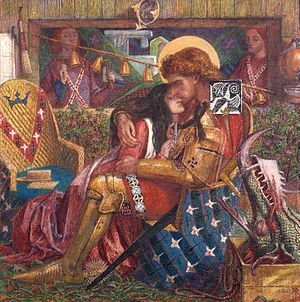 The Wedding of St George and Princess Sabra by Dante Gabriel Rossetti (1857). In the General Roman Calendar, the feast of Saint George is on 23 April. In the Tridentine Calendar of 1568, it was given the rank of "Semidouble". In Pope Pius XII's 1955 calendar this rank was reduced to "Simple", and in Pope John XXIII's 1960 calendar to a "Commemoration". Since Pope Paul VI's 1969 revision, it appears as an optional "Memorial". In some countries, such as England, the rank is higher. In England, it is a Solemnity (Roman Catholic) or Feast (Church of England): if it falls between Palm Sunday and the Second Sunday of Easter inclusive, it is transferred to the Monday after the Second Sunday of Easter. Saint George is very much honoured by the Eastern Orthodox Church, wherein he is referred to as a "Great Martyr", and in Oriental Orthodoxy overall. His major feast day is on 23 April (Julian calendar 23 April currently corresponds to Gregorian calendar 6 May). If, however, the feast occurs before Easter, it is celebrated on Easter Monday, instead. The Russian Orthodox Church also celebrates two additional feasts in honour of St. George. One is on 3 November, commemorating the consecration of a cathedral dedicated to him in Lydda during the reign Constantine the Great (305–37). When the church was consecrated, the relics of the Saint George were transferred there. The other feast is on 26 November for a church dedicated to him in Kiev, circa 1054. In Bulgaria, Saint George's day (Bulgarian: Гергьовден) is celebrated on 6 May, when it is customary to slaughter and roast a lamb. Saint George's day is also a public holiday. In Egypt, the Coptic Orthodox Church of Alexandria refers to Saint George (Coptic: Ⲡⲓⲇⲅⲓⲟⲥ Ⲅⲉⲟⲣⲅⲓⲟⲥ or ⲅⲉⲱⲣⲅⲓⲟⲥ) as the "Prince of Martyrs" and celebrates his martyrdom on the 23rd of Paremhat of the Coptic calendar equivalent to 1 May. The Copts also celebrate the consecration of the first church dedicated to him on seventh of the month of Hatour of the Coptic calendar usually equivalent to 17 November. In India, the Syro-Malabar Catholic Church, one of the oriental catholic churches (Eastern Catholic Churches) and Malankara orthodox church venerate Saint George. The main pilgrim centers of the saint in India are at Edathua in Alappuzha district and Edappally  in Ernakulam district of the southern state of Kerala. The saint is commemorated each year from 27 April to 14 May at Edathua  On 27 April after the flag hoisting ceremony by the parish priest, the statue of the saint is taken from one of the altars and placed at the extension of the church to be venerated by the devotees till 14 May. The main feast day is 7 May, when the statue of the saint along with other saints is taken in procession around the church. Intercession to Saint George of Edathua is believed to be efficacious in repelling snakes and in curing mental ailments.The sacred relics of St. George were brought to Antioch from Mardeen in A.D.900 and were taken to Kerala, India from Antioch in 1912 by Mar Dionysius of Vattasseril and kept in the Orthodox seminary at Kundara, Kerala. H.H Mathews II Catholicos had given the relics to St. George churches at Puthupally, Kottayam District and Chandanappally, Pathanamthitta district. George is a highly celebrated saint in both the Western and Eastern Christian churches, and a large number of Patronages of Saint George exist throughout the world. Saint George is the patron saint of England. His cross forms the national flag of England, and features within the Union Flag of the United Kingdom, and other national flags containing the Union Flag, such as those of Australia and New Zealand. By the 14th century, the saint had been declared both the patron saint and the protector of the royal family. The country of Georgia, where devotions to the saint date back to the fourth century, is not technically named after the saint, but is a well-attested back-formation of the English name. However, a large number of towns and cities around the world are. Saint George is one of the patron Saints of Georgia; the name Georgia (Sakartvelo in Georgian) is an anglicisation of Gurj, ultimately derived from the Persian word gurj/gurjān ("wolf"). Chronicles describing the land as Georgie or Georgia in French and English, date from the early Middle Ages, as written by the travellers John Mandeville and Jacques de Vitry "because of their special reverence for Saint George", but these accounts have been seen as folk etymology and are rejected by the scholarly community. Exactly 365 Orthodox churches in Georgia are named after Saint George according to the number of days in a year. According to legend, Saint George was cut into 365 pieces after he fell in battle and every single piece was spread throughout the entire country. Saint George is also one of the patron saints of the Mediterranean islands of Malta and Gozo. In a battle between the Maltese and the Moors, Saint George was alleged to have been seen with Saint Paul and Saint Agata, protecting the Maltese. Saint George is the protector of the island of Gozo and the patron of Gozo's largest city, Victoria. The St. George's Basilica in Victoria is dedicated to him. Devotions to Saint George in Portugal date back to the 12th century. Nuno Álvares Pereira attributed the victory of the Portuguese in the battle of Aljubarrota in 1385 to Saint George. During the reign of John I of Portugal (1357–1433), Saint George became the patron saint of Portugal and the King ordered that the saint's image on the horse be carried in the Corpus Christi procession. The flag of Saint George (white with red cross) was also carried by the Portuguese troops and hoisted in the fortresses, during the 15th century. "Portugal and Saint George" became the battle cry of the Portuguese troops, being still today the battle cry of the Portuguese Army, with simply "Saint George" being the battle cry of the Portuguese Navy. Saint George, is also the patron saint of the region of Aragon, in Spain, where his feast day is celebrated on the 23rd of April and is known as "Aragon Day", or 'Día de Aragón' in Spanish. He became the patron saint of the former Kingdom of Aragon and Crown of Aragon when King Pedro I of Aragon won the Battle of Alcoraz in 1096. Legend has it that victory eventually fell to the Christian armies when St. George appeared to them on the battlefield, helping them secure the reconquest of the city of Huesca which had been under the Muslim control of the Taifa of Zaragoza. The battle, which had begun two years earlier in 1094, was long and arduous, and had also taken the life of King Pedro's own father, King Sancho Ramirez. With the Aragonese spirits flagging, it is said that Saint George descending from Heaven on his charger and bearing a dark red cross, appeared at the head of the christian cavalry leading the knights into battle. Interpreting this as a sign of protection from God, the Christian militia returned emboldened to the battle field, more energized than ever, convinced theirs was the banner of the one true faith. Defeated, the moors rapidly abandoned the battlefield. After two years of being locked down under siege, Huesca was liberated and King Pedro made his triumphal entry into the city. To celebrate this victory, the cross of Saint George was adopted as the coat of arms of Huesca and Aragon, in honour of their saviour. After the taking of Huesca, King Pedro aided the military leader and nobleman, Rodrigo Díaz de Vivar, otherwise known as El Cid, with a coalition army from Aragon in the long reconquest of the Kingdom of Valencia. Tales of King Pedro's success at Huesca and in leading his expedition of armies with El Cid against the Moors, under the auspices of Saint George on his standard, spread quickly throughout the realm and beyond the Crown of Aragon, and Christian armies throughout Europe quickly began adopting Saint George as their protector and patron, during all subsequent Crusades to the Holy Lands. By 1117, the military order of Templars adopted the Cross of Saint George as a simple unifying sign for international christian militia embroidered on the left hand side of their tunics, placed above the heart. The Cross of Saint George, also known in Aragon as The Cross of Alcoraz, continues to emblazon the flags of all of Aragon's provinces. The association of Saint George with chivalry and noblemen in Aragon continued through the ages. Indeed, even the author Miguel de Cervantes, in his book on the Adventures of Don Quixote, also mentions the Jousting events that took place at the festival of Saint George in Zaragoza in Aragon where one could gain international renown in winning a joust against any of the knights of Aragon. In Valencia, Catalonia, the Balearics, Malta, Sicily and Sardinia, the origins of the veneration of Saint George go back to their shared history as territories under the Crown of Aragon, thereby sharing the same legend. One of the highest civil distinctions awarded in Catalonia is the Saint George's Cross (Creu de Sant Jordi). The Sant Jordi Awards have been awarded in Barcelona since 1957. Saint George (Sant Jordi in Catalan) is also the patron saint of Catalonia. His cross appears in many buildings and local flags, including the flag of Barcelona, the Catalan capital. A Catalan variation to the traditional legend places Saint George's life story as having occurred in the town of Montblanc, near Tarragona. It became fashionable in the 15th century, with the full development of classical heraldry, to provide attributed arms to saints and other historical characters from the pre-heraldic ages. The widespread attribution to Saint George of the red cross on a white field in western art - "Saint George's Cross" - probably first arose in Genoa, which had adopted this image for their flag and George as their patron saint in the 12th century. A vexillum beati Georgii is mentioned in the Genovese annals for the year 1198, referring to a red flag with a depiction of Saint George and the dragon. An illumination of this flag is shown in the annals for the year 1227. The Genoese flag with the red cross was used alongside this "George's flag", from at least 1218, and was known as the insignia cruxata comunis Janue ("cross ensign of the commune of Genoa"). The flag showing the saint himself was the city's principal war flag, but the flag showing the plain cross was used alongside it in the 1240s. In 1348 Edward III of England chose Saint George as the patron saint of his Order of the Garter, and also took to using a red-on-white cross in the hoist of his Royal Standard. The term "Saint George's cross" was at first associated with any plain Greek cross touching the edges of the field (not necessarily red on white). Thomas Fuller in 1647 spoke of "the plain or St George's cross" as "the mother of all the others" (that is, the other heraldic crosses). Byzantine icon of Saint George, Athens, Greece. Saint George is most commonly depicted in early icons, mosaics, and frescos wearing armour contemporary with the depiction, executed in gilding and silver colour, intended to identify him as a Roman soldier. Particularly after the Fall of Constantinople and Saint George's association with the crusades, he is often portrayed mounted upon a white horse. Thus, a 2003 Vatican stamp (issued on the anniversary of the Saint's death) depicts an armoured Saint George atop a white horse, killing the dragon. 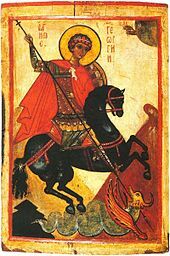 Eastern Orthodox iconography also permits Saint George to ride a black horse, as in a Russian icon in the British museum collection. In the south Lebanese village of Mieh Mieh, the Saint George Church for Melkite Catholics commissioned for its 75th jubilee in 2012 (under the guidance of Mgr Sassine Gregoire), the only icons in the world portraying the whole life of Saint George, as well as the scenes of his torture and martyrdom (drawn in eastern iconographic style). 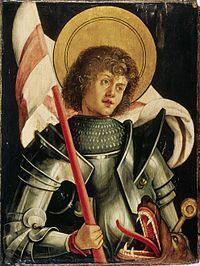 Saint George may also be portrayed with Saint Demetrius, another early soldier saint. When the two saintly warriors are together and mounted upon horses, they may resemble earthly manifestations of the archangels Michael and Gabriel. 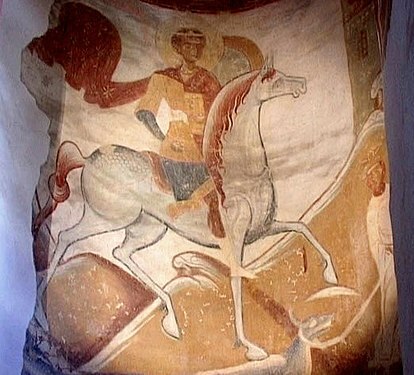 Eastern traditions distinguish the two as Saint George rides a white horse and St. Demetrius a red horse (the red pigment may appear black if it has bitumenized). Saint George can also be identified by his spearing a dragon, whereas Saint Demetrius may be spearing a human figure, representing Maximian. During the early second millennium, Saint George became a model of chivalry in works of literature, including medieval romances. In the 13th century, Jacobus de Voragine, Archbishop of Genoa, compiled the Legenda Sanctorum, (Readings of the Saints) also known as Legenda Aurea (the Golden Legend). Its 177 chapters (182 in some editions) include the story of Saint George, among many others. After the invention of the printing press, the book became a bestseller. 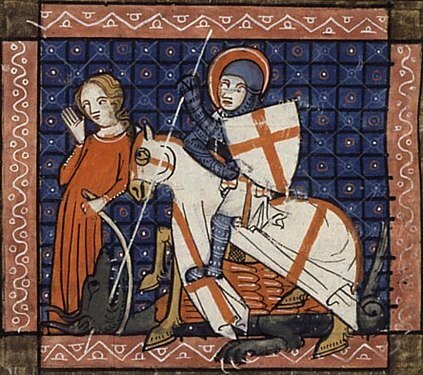 For equestrian depictions, see Saint George and the Dragon#Iconography. For a structured gallery, see: Saint George gallery. 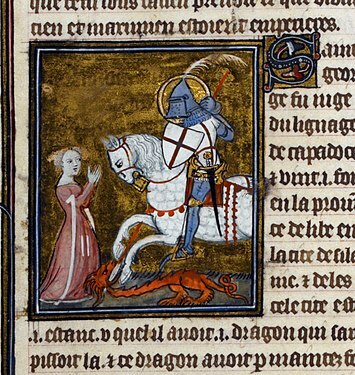 Miniature of Saint George and the Dragon, ms. of the Legenda Aurea, Paris, 1382 (BL Royal 19 B XVII, f. 109). Ederlezi, song and Romani name for the Bulgarian, Macedonian and Serbian Feast of Saint George. Moors and Christians of Alcoy, an international historical festival dedicated to Saint George in Alcoy (Alicante), Spain. ^ Foakes-Jackson, FJ (2005), A History of the Christian Church, Cosimo Press, p. 461, ISBN 1-59605-452-2 . ^ Ball, Ann (2003), Encyclopedia of Catholic Devotions and Practices, p. 568, ISBN 0-87973-910-X . ^ Otto Friedrich August Meinardus, Two Thousand Years of Coptic Christianity (1999), p. 315. ^ Acta Sanctorum Aprilis t. III (vol. 12), 101–165; Martyrology of Usuard (9th century). Immediately on the publication of the decree against the churches in Nicomedia, a certain man, not obscure but very highly honored with distinguished temporal dignities, moved with zeal toward God, and incited with ardent faith, seized the edict as it was posted openly and publicly, and tore it to pieces as a profane and impious thing; and this was done while two of the sovereigns were in the same city,—the oldest of all, and the one who held the fourth place in the government after him. But this man, first in that place, after distinguishing himself in such a manner suffered those things which were likely to follow such daring, and kept his spirit cheerful and undisturbed till death. ^ Walter, Christopher (2003), The Warrior Saints in Byzantine Art and Tradition, Ashgate Publishing, p. 110, ISBN 1-84014-694-X . Bibliotheca Hagiographica Graeca 271, 272. ^ Guiley, Rosemary (2001). The Encyclopedia of Saints. p. 129. ISBN 9781438130262. George was an historical figure. According to an account by Metaphrastes, he was born in Cappadocia (in modern Turkey) to a noble Christian family; his mother was Palestinian. ^ Heylin, A (1862), The Journal of Sacred Literature and Biblical Record, 1, p. 244 . Darch, John H (2006), Saints on Earth, Church House Press, p. 56, ISBN 978-0-7151-4036-9 . Walter, Christopher (2003), The Warrior Saints in Byzantine Art and Tradition, Ashgate Publishing, p. 112, ISBN 1-84014-694-X . ^ a b c "Saint George", Catholic Encyclopedia, it is not improbable that the apocryphal Acts have borrowed some incidents from the story of the Arian bishop . ^ Hackwood, Fred (2003), Christ Lore the Legends, Traditions, Myths, Kessinger Publishing, p. 255, ISBN 0-7661-3656-6 . ^ Michael Collins, St George and the Dragons: The Making of English Identity (2018), p. 129. ^ Attwater, Donald (1995) . Dictionary of Saints (Third ed.). London: Penguin Reference. p. 152. His best-known story, popularized in the later middle ages by the Golden Legend, tells that he was a knight from Cappadocia, who rescued a maiden princess from a dragon at Silene in Libya, leading to the Christianity of much of the kingdom. ^ a b Thurston, Herbert (1913). "St. George" . In Herbermann, Charles (ed.). Catholic Encyclopedia. New York: Robert Appleton Company. 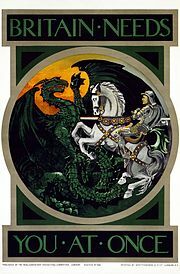 "There seems, therefore, no ground for doubting the historical existence of St. George, even though he is not commemorated in the Syrian, or in the primitive Hieronymian Martyrologium, but no faith can be placed in the attempts that have been made to fill up any of the details of his history. For example, it is now generally admitted that St. George cannot safely be identified by the nameless martyr spoken of by Eusebius (Church History VIII.5), who tore down Diocletian's edict of persecution at Nicomedia. The version of the legend in which Diocletian appears as persecutor is not primitive. Diocletian is only a rationalized form of the name Dadianus. Moreover, the connection of the saint's name with Nicomedia is inconsistent with the early cultus at Diospolis. Still less is St. George to be considered, as suggested by Gibbon, Vetter, and others, a legendary double of the disreputable bishop, George of Cappadocia, the Arian opponent of St. Athanasius." ^ Spenser, Edmund (1998), Fierce Wars and Faithful Loves, Cannon Press, p. 196, ISBN 978-1-885767-39-4 . ^ Mills, Charles (2012), The History of Chivalry, Longman, Rees, p. 9 . ^ Richardson, Robert D; Moser, Barry, eds. (1996), Emerson, p. 520, George of Cappadocia... [held] the contract to supply the army with bacon... embraced Arianism... [and was] promoted... to the episcopal throne of Alexandria... When Julian came, George was dragged to prison, the prison was burst open by a mob, and George was lynched... [he] became in good time Saint George of England . ^ William Caxton's Golden Legend (1483), modernised translation by Frederick Startridge Ellis (1900); catholicsaints.info. ^ De Voragine, Jacobus (1995), The Golden Legend, Princeton University Press, p. 238, ISBN 978-0-691-00153-1 . ^ a b Scott B. Noegel, Brannon M. Wheeler. The A to Z of Prophets in Islam and Judaism. Rowman & Littlefield. p. 313. ^ a b H. S. Haddad (1968). ""Georgic" Cults and Saints of the Levant". Numen. Brill: 37. ^ Bernard Carra de Vaux. P. Bearman; Th. Bianquis; C.E. Bosworth; E. van Donzel; W. P. Heinrichs (eds.). Encyclopaedia of Islam. I, Part 2 (Second ed.). Brill. p. 1047. ^ Samantha Riches, St. George: Hero, Martyr and Myth (Sutton, 2000), ISBN 0750924527, p. 19. ^ Perrin, British Flags, 1922, p. 38. ^ Runciman, Steven (1951–52). A History of the Crusades I: The First Crusade. Penguin Classics. pp. 204–205. ISBN 978-0-141-98550-3. ^ Catholic Encyclopedia 1913, s.v. "Orders of St. George" omits Genoa and Hungary: see David Scott Fox, Saint George: The Saint with Three Faces (1983:59–63, 98–123), noted by McClellan 999:6 note 13. Additional Orders of St. George were founded in the eighteenth century (Catholic Encyclopedia). 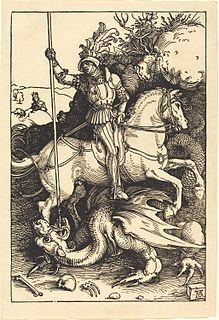 ^ Desiderius Erasmus, in The Praise of Folly (1509, printed 1511) remarked "The Christians have now their gigantic St. George, as well as the pagans had their Hercules." ^ Muriel C. McClendon, "A Moveable Feast: Saint George's Day Celebrations and Religious Change in Early Modern England" The Journal of British Studies 38.1 (January 1999:1–27). ^ Hanauer, JE (1907). "Folk-lore of the Holy Land, Moslem, Christian and Jewish". Retrieved January 18, 2007. ^ a b c William Dalrymple (March 15, 1999). From the Holy Mountain: a journey among the Christians of the Middle East. Owl Books. ^ H. S. Haddad. ""Georgic" Cults and Saints of the Levant". JSTOR 3269569. ^ Chisholm, Hugh, ed. (1911). "George, Saint". Encyclopædia Britannica. 11 (11th ed.). Cambridge University Press. p. 737. ^ Elizabeth Anne Finn (1866). Home in the Holyland. London: James Nisbet and Co. pp. 46–7. p. 46. ^ Middle East and Africa: International Dictionary of Historic Places. I.B. Tauris. p. 525. ^ "Islamic militants destroy historic 14th century mosque in Mosul". The Telegraph. ^ Teresa Fitzherbert. "Religious Diversity Under Ilkhanid Rule". In Linda Komaroff (ed.). Beyond the Legacy of Genghis Khan. Brill. p. 402. ^ B, Sathish (20 March 2008). "St.George forane church Edathua-689573". Edathuapalli. Sathish B. Retrieved 5 February 2017. ^ St:George Church (22 April 2014). "St.George forane church Edappally". Edappally. St: George Church. Retrieved 5 February 2017. ^ "Arrangements for Edathua church fete". The Hindu. ALAPPUZHA. 3 April 2016. Retrieved 5 February 2017. ^ Seal, Graham (2001), Encyclopedia of folk heroes, p. 85, ISBN 1-57607-216-9 . ^ Hinds, Kathryn (2001), Medieval England, Marshall Cavendish, p. 44, ISBN 0-7614-0308-6 . ^ Morgan, Giles (2017-03-23). St George: The patron saint of England. Oldcastle Books. ISBN 9781843449676. ^ Fargher, Brian L. (1996). The Origins of the New Churches Movement in Southern Ethiopia: 1927 - 1944. BRILL. ISBN 9789004106611. ^ a b Mikaberidze, Alexander (2015). Historical Dictionary of Georgia (2 ed.). Rowman & Littlefield. p. 3. ISBN 978-1442241466. ^ David Marshall Lang, The Georgians, (New York: Frederick A Praeger, 1966), 17–18. The terms Georgia and Georgians appeared in Western Europe in numerous early medieval annals. The French chronicler Jacques de Vitry and the English traveller John Mandeville wrote that Georgians are called 'Georgian' because they especially revere Saint George. ^ Gabidzashvili, Enriko (1991), Saint George: In Ancient Georgian Literature, Tbilisi, Georgia: Armazi – 89 . ^ Foakes-Jackson, FJ (2005), A History of the Christian Church, Cosimo, p. 556, ISBN 1-59605-452-2 . ^ Eastmond, Antony (1998), Royal Imagery in Medieval Georgia, Penn State Press, p. 119, ISBN 0-271-01628-0 . ^ Vella, George Francis. "St George, the patron saint of Gozo". Times of Malta. Times of Malta. Retrieved 26 January 2017. "The patron saint and protector of Gozo". Times of Malta. Times of Malta. Retrieved 26 January 2017. ^ de Bles, Arthur (2004), How to Distinguish the Saints in Art, p. 86, ISBN 1-4179-0870-X . ^ de Oliveira Marques, AH; André, Vítor; Wyatt, SS (1971), Daily Life in Portugal in the Late Middle Ages, University of Wisconsin Press, p. 216, ISBN 0-299-05584-1 . ^ Fuller, A Supplement tu the Historie of the Holy Warre (Book V), 1647, chapter 4. ^ "Vatican stamps". Vaticanstate.va. Archived from the original on 2011-10-01. Retrieved 2011-04-23. Brook, E.W., 1925. Acts of Saint George in series Analecta Gorgiana 8 (Gorgias Press). Gabidzashvili, Enriko. 1991. Saint George: In Ancient Georgian Literature. Armazi – 89: Tbilisi, Georgia. Good, Jonathan, 2009. The Cult of Saint George in Medieval England (Woodbridge, Suffolk: The Boydell Press). Natsheh, Yusuf. 2000. "Architectural survey", in Ottoman Jerusalem: The Living City 1517–1917. Edited by Sylvia Auld and Robert Hillenbrand (London: Altajir World of Islam Trust) pp 893–899. George Menachery, Saint Thomas Christian Encyclopaedia of India. Vol.II Trichur – 73. 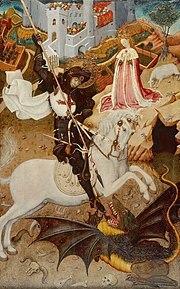 Wikimedia Commons has media related to Saint George. Wikisource has the text of The New Student's Reference Work article about "Saint George". St. George, Martyr at the Christian Iconography web site. Agnes of Rome is a virgin martyr, venerated as a saint in the Roman Catholic Church, Eastern Orthodox Church, the Anglican Communion, and Lutheranism. She is one of seven women who, along with the Blessed Virgin, are commemorated by name in the Canon of the Mass. Saint Vitus, according to Christian legend, was a Christian saint from Sicily. He died as a martyr during the persecution of Christians by co-ruling Roman Emperors Diocletian and Maximian in 303. Vitus is counted as one of the Fourteen Holy Helpers of medieval Roman Catholicism. Saint Vitus' Day is celebrated on 15 June. In places where the Julian Calendar is used, this date coincides, in the 20th and 21st centuries, with 28 June on the Gregorian Calendar. Saint Sebastian was an early Christian saint and martyr. According to traditional belief, he was killed during the Roman emperor Diocletian's persecution of Christians, initially being tied to a post or tree and shot with arrows, though this did not kill him. He was, according to tradition, rescued and healed by Saint Irene of Rome, which became a popular subject in 17th-century painting. In all versions of the story, shortly after his recovery he went to Diocletian to warn him about his sins, and as a result was clubbed to death. He is venerated in the Roman Catholic Church and the Orthodox Church. Saint Eustace, also known as Eustachius or Eustathius in Latin, is revered as a Christian martyr and soldier saint. Legend places him in the 2nd century AD. A martyr of that name is venerated as a saint in the Anglican Church. He is commemorated by the Roman Catholic Church and the Orthodox Church on September 20. Saint Demetrios of Thessaloniki is a Christian martyr of the early 4th century AD. Saint Theodore of Amasea is one of the two recognized saints called Theodore who are venerated as warrior saints and Great Martyrs in the Orthodox and Roman Catholic Churches. He is also known as Theodore Tyron. The other saint of the same name is Theodore Stratelates, also known as Theodore of Heraclea, but this second St Theodore may never have had a separate existence. When the epithet is omitted, the reference is usually to St Theodore of Amasea. Saint George's Day, also known as the Feast of Saint George, is the feast day of Saint George as celebrated by various Christian Churches and by the several nations, kingdoms, countries, and cities of which Saint George is the patron saint including England, Catalonia and Aragon. Saint Pancras was a Roman citizen who converted to Christianity, and was beheaded for his faith at the age of fourteen, around the year 304. His name is Greek (Παγκράτιος) and means "the one that holds everything". Saint Euphemia, "well-spoken [of]", known as the All-praised in the Orthodox Church, is a Christian saint, who was martyred for her faith in 303 AD. According to Christian tradition, this occurred at Chalcedon. Saint Chrysogonus is a saint and martyr of ancient Rome venerated by the Roman Catholic Church and the Orthodox Church. George is a widespread masculine given name, derived from the Greek Γεώργιος through the Latin Georgius. Its popularity is due to the widespread veneration of the Christian military saint Saint George . The Greek name as given in the Roman era may ultimately derive from the name of Zeus Georgos, an epithet of Zeus in his aspect as the god of crops. Saint George is one of Christianity's most popular saints, and is highly honored by both the Western and Eastern Churches. A wide range of devotions, traditions, and prayers to honor the saint have emerged throughout the centuries. He has for long been distinguished by the title of "The Great Martyr" and is one of the most popular saints to be represented in icons. Devotions to Saint George have a large following among Christians, and a large number of churches are dedicated to him worldwide. As a highly celebrated saint in both the Western and Eastern Christian churches, Saint George is connected with a large number of patronages throughout the world, and his iconography can be found on the flags and coats of arms of a number of cities and countries. Saint Dorothy is a 4th-century virgin martyr who was executed at Caesarea Mazaca. Evidence for her actual historical existence or acta is very sparse. She is called a martyr of the Diocletianic Persecution, although her death occurred after the resignation of Diocletian himself. She should not be confused with another 4th-century saint, Dorothea of Alexandria.